When travelling with children, you will be seated next to each other if you check in early – if you arrive at the check-in desk at the last minute, there probably won’t be any side-by-side seats available. It makes sense to pack essential children’s supplies such as diapers, medicines, and baby food in your hand baggage to be prepared for any inconveniences such as your flight being delayed. All children, including infants, must have a valid travel document! Further information on travelling with children is available on the website of the Estonian Ministry of Foreign Affairs. Important! Different airlines may have different requirements and conditions. We recommend that travellers contact the airline or the representative who sold their ticket to be aware of such requirements and conditions. When travelling with a baby, you are allowed to take the food your baby needs during the flight on board the aircraft. The food may also be in a container larger than 100 ml, such as a flask with water or a feeding bottle with milk or baby formula. You also don’t have to place the baby food in a transparent plastic bag. You can also carry solid baby food, e.g. various purées, in your hand baggage. Still, you should be prepared for the container being opened for sampling at the security control. Normally, prams must be checked in as baggage and handed over at the check-in desk. For some flights, you may be allowed to use your own pram or stroller until you reach the gate but you have to make sure you agree on this at the check-in desk. Tallinn Airport passenger terminal has strollers for the really wee ones and older toddlers alike. Important! As some aircraft are boarded using stairs, we recommend passengers travelling alone with small children to notify airport employees in advance if they need assistance moving on the stairs with a child and their hand baggage. The passenger terminal has rooms furnished with baby changing facilities next to the toilets. There are a total of 6 of these rooms scattered around the terminal, all marked correspondingly. The passenger terminal has two children’s playgrounds. 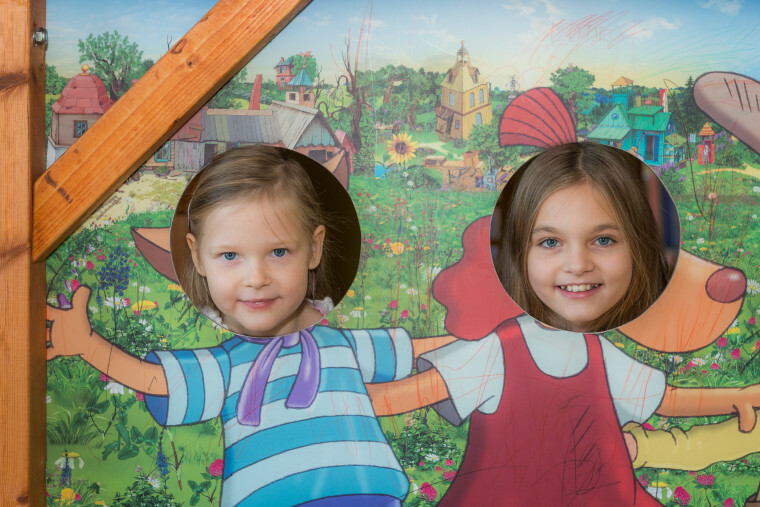 The bigger one, the Lotte Playground, is located next to the Kalev Candy and Toy Store at Gate 5 and the other one can be found in the Non-Schengen area. The centrepiece of the Lotte Playground is the three-storey Lotte house for children to climb on and slide off. Children can enjoy cartoons shown on the wall of the house while sitting in comfortable bean bags. The desks next to the house have drawing paper and coloured pencils for children to relieve any travel anxiety and have fun while waiting for their flight. Come to the airport early so that the smaller members of your family could fully enjoy your trip from the get-go! Children are allowed to travel alone when they reach the age of 12. If necessary, airport and airline employees will ensure that the children’s travels are smooth and stress-free. You should, nevertheless, check your airline’s policy before travelling because there could always be exceptions (e.g. EasyJet and Ryanair aircraft have an age limit of 16). It is also recommended that you always have your child carry documented parental consent that the child is allowed to travel alone. Additionally, most airlines have an Unaccompanied Minor service where the airline takes responsibility for a child aged 5-11 getting on board the aircraft and being delivered to the destination. If you wish to use this service, you should notify the airline well in advance. In most countries, written parental consent containing information on where and when the child will travel and the necessary contact details is sufficient to have a child travel alone. There are, however, countries where notarised parental consent is required. When in doubt, you should review the immigration requirements of the respective destination country.